Can you hear the wedding bells tolling in your future? Tis the season, brides to be, and at StickerYou we have the hottest wedding favour ideas that are sure to impress your guests and make you the Bride-To-Beat! 1) Mini portraits: Give each guest a beautiful mini frame with the date of the wedding stamped in the corner. Guests will be able to put their own photos from your wedding in the frame as keepsakes. Take it one step further by adding single-use cameras to each table so guests can snap their own pics. 2) The ever-popular cookie bar: All you need is a stack of small folding paper containers and 4-5 different kinds of cookies. Place each kind of cookie in a different jar or bowl and let your guests create their own cookie-take-away package. 3) Photo strips: Rent an old school photo booth and have your guests cram in for group pics. The booth will develop the photos in strips which your guests can then take home and cherish as mementos from the best wedding ever. SocialPhotoBooth.com even lets you choose from a variety of props, backgrounds, and messages to include the photos. 4) Temporary tattoos: Create some fun temporary tattoos for your guests at StickerYou.com. Deck out your wedding party or leave a small bowl on each table and give your guests something to do. Tats like “ask me how I know the Bride” or “I’m the Groom’s _____” make great icebreakers for your guests. 5)Candy Tubes: Fill bowls with different colored m&ms. Allow your guests to fill little plastic tubes with colourful layers. Anyone with a sweet tooth will love this- kids especially! 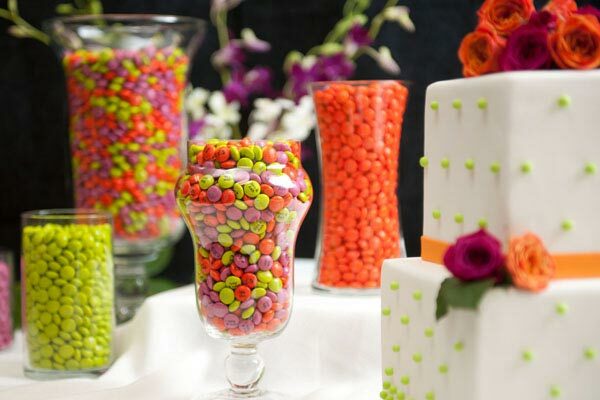 Save yourself some time and buy only the colours of M&Ms you want in bulk at mymms.com. You can even have personal messages and pictures printed on them. 6)Jones Soda labels: You know that iconic soda brand that has a different label for every single bottle? Try creating your own “ amazing wedding collection” of labels on JonesSoda.com. Upload pics of your and your hubby and choose your own drink flavours to create custom packs. Match the flavours with your wedding colours and you’ll have some beautiful and delicious beverages! 7) Popcorn bags: Help your guests get through all the speeches and wedding party photos with snack bags of popcorn. You can create a custom stamp at WeddingPaperDivas.com and stamp each bag to add a little style. Be efficient and consistent by re-using the stamp on your wedding invitations, thank you cards, placecards and more! 8) Monogrammed Soap: At Saponetta.com, you can create your own custom monogrammed soaps. Personalize them further with your favourite quotes or wedding colours. Wrap with some ribbon and you’re good to go. 9) Chalkboard Coasters: You can buy these in sets from TheKnotShop.com or create your own with ceramic squares and chalkboard paint. Include a couple sticks of chalk and guests will be drawing on their own awesome coaster.